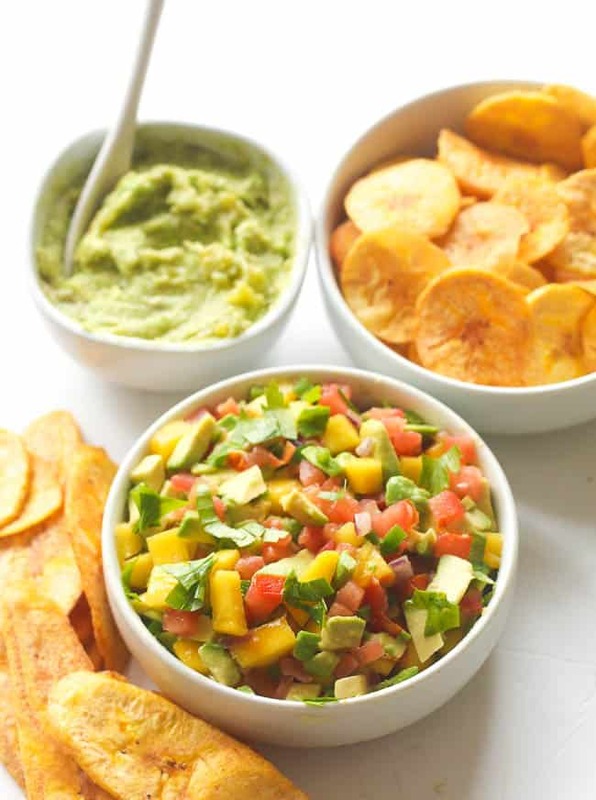 There is just something alluring about the textural blend of this mango avocado salsa and plantains chips; spicy, sweet, salty, exotic, and crunchy. Mangos are my all time favorite tropical fruit dating back to my childhood. Paired with creamy avocado and topped with crunchy chips and it is a match made in heaven. The flavor of the salsa is Light, refreshing and oh-so simple, heightened by the jalapeños and onions. It is hard to think of better way to way to start off spring. 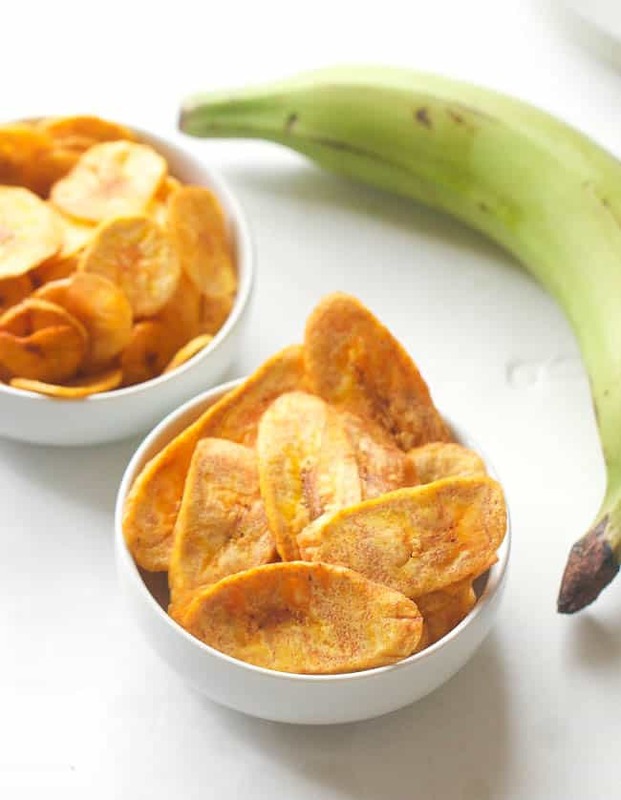 For the plantains, I tried to make a side by side comparison of fried and baked plantains chips – love them both. 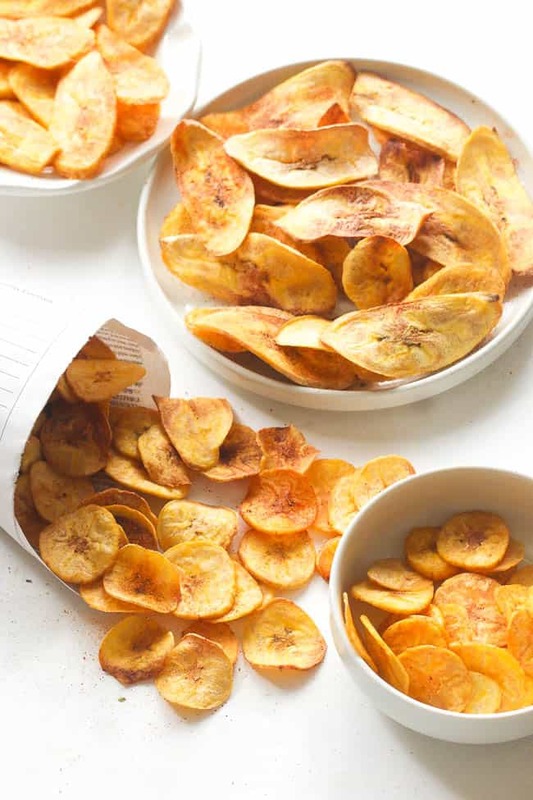 These chips have always been my comfort food – a nice alternative to tortilla chips. 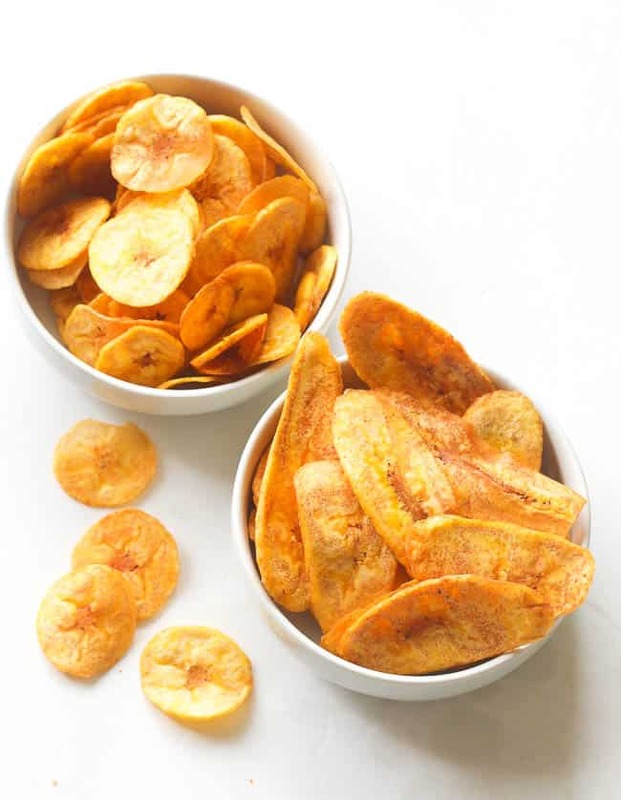 In West Africa, Plantains are found everywhere and are used various ways – sese plantains, kelewele, boil, and during different stages of ripeness: ripe (yellow to dark brown), medium ripe (between yellow and green) and unripe- green. 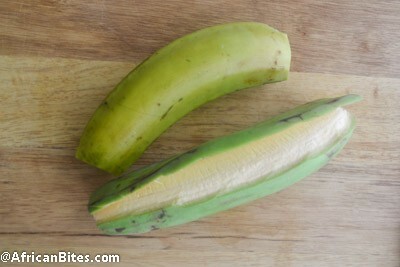 Boy, was I ecstatic, when it became obvious that I could get plantains in a supermarket in Los Angeles. 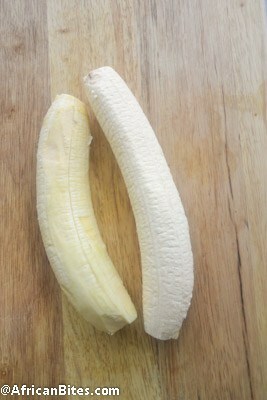 For the plantain chips, you will need to use unripe (green) plantains or slightly ripe plantains. 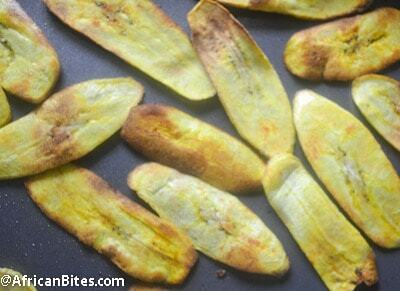 Be careful when baking slightly ripe plantains it might not retain its crispness. 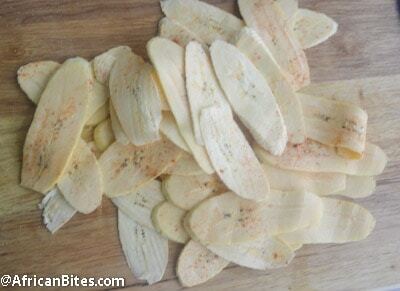 To achieve even crispness, a mandolin is ideal for cutting the plantains, as cutting with a knife can be very tedious but doable. 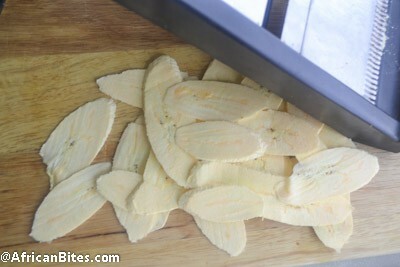 When baking these chips, it is best to watch them closely to prevent burning.-they cook so fast. Be sure to find the most favorable temperature and time for your oven, an even heat is needed. 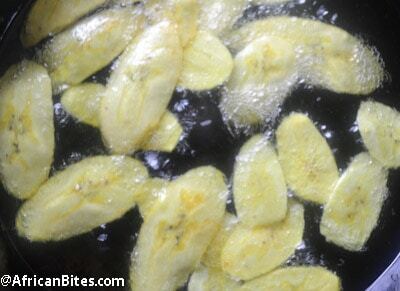 If you prefer frying your plantain, do so in small batch at 375 , without overcrowding the pan to a crisp crunch. 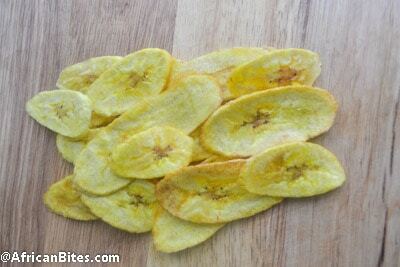 After making both fried and baked plantains chips, I can truly say picking one way of making planttain chips depends entirely on you. 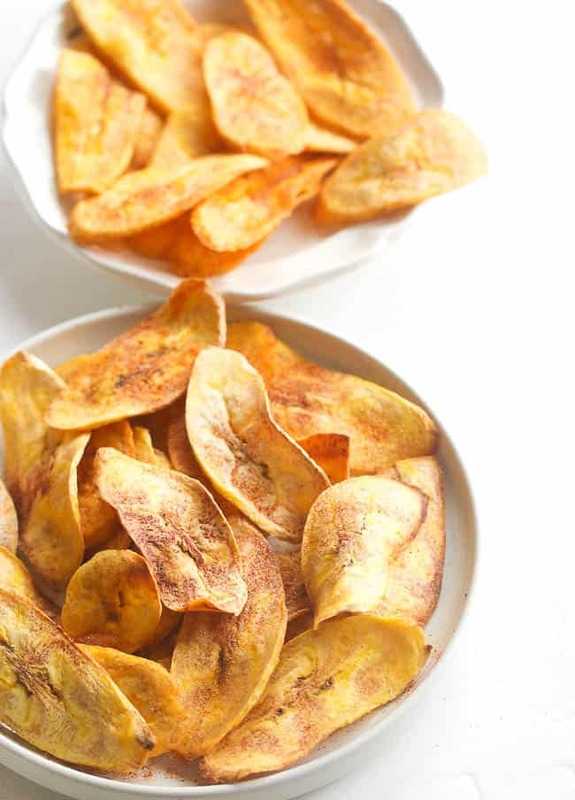 The fried plantain chips are crisp all the way through. 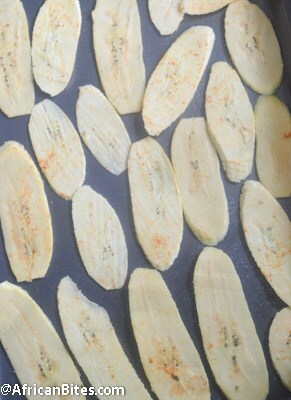 On the other hand, the baked chips are drier and also have a crisp crunch. They can get chewy if not baked well. Taste wise- slight difference , If you take in to consideration that , with baked chips you, will be able to consume twice the amount of chips. I mixed both fried and baked chips, serve them to my son and he gobbled it, within a few minutes.Now try it and see which one you prefer. 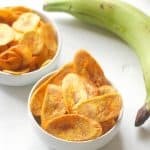 Plantain Chips - crispy, crunchy and addictive fried/baked plantain chips paired with sweet tango mango avocado salsa for a wonderful late night snack time or as appetizers! 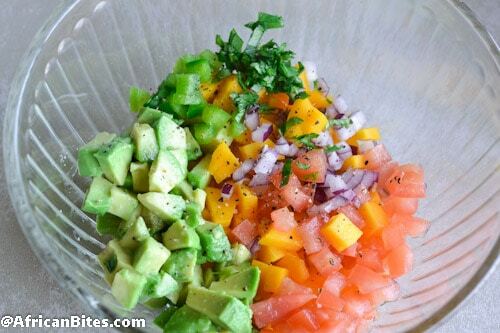 In a medium bowl, combine the mango, jalapenos, avocado, tomatoes, onions, lime juice, olive oil, salt, and pepper. Preheat the oven to 400°F. Line baking sheets with foil and coat with cooking spray. 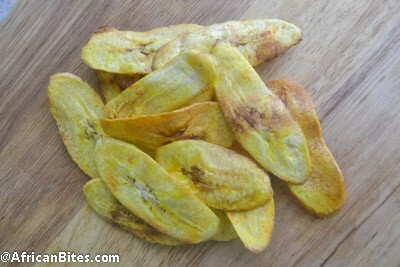 Mix plantains, salt and paprika. Toss them together. Store in a sealed container or serve with salsa.